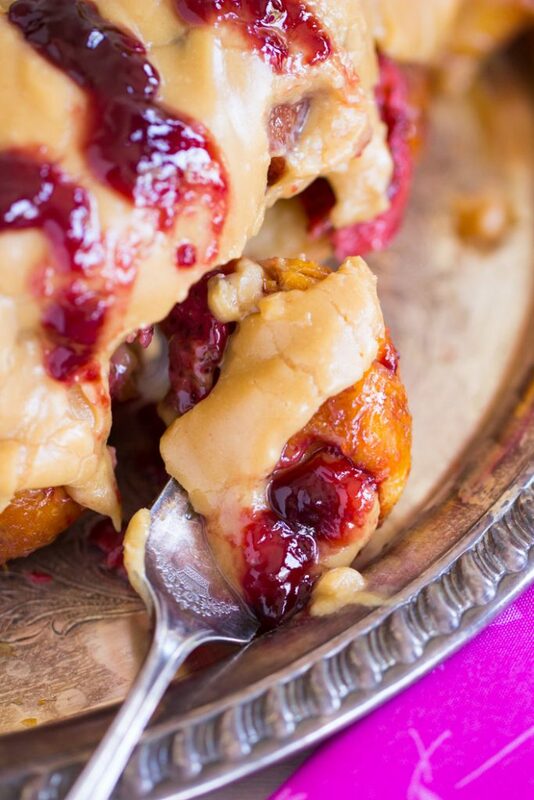 Pillowy, flaky bites of dough are nestled with fresh strawberries, and bathed in a simple caramel syrup, then topped with thick, sweet peanut butter glaze in this Peanut Butter & Jelly Monkey Bread Recipe. This is quick to assemble, and feeds a crowd! Goooood morning! How was your weekend, readers? I spent the better part of mine trying to acclimate back to EST after returning from vacation on Friday evening from out west. I’m definitely still on Pacific coast time. It’s almost 1am as I write this, and I definitely need to reinstate a normal bedtime schedule here, but I can’t seem to make myself. I’m a bit of a night owl anyway, and I tend to be really productive in the late evening, so I’m not being all that strict about enforcing a curfew. I figure, if I’m still toiling away and getting things done, why stop? Oh, right… because I have a day job to wake up early for tomorrow. Eek. My mind is on the weekend already. 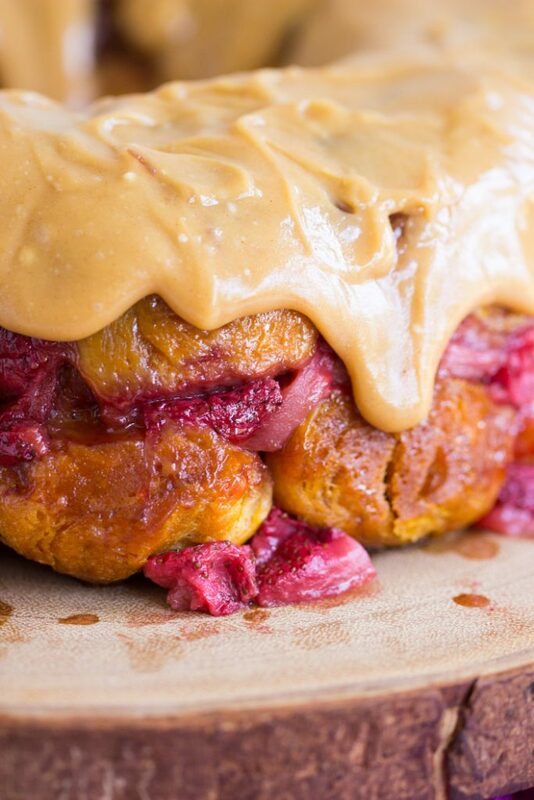 I made this Peanut Butter & Jelly Monkey Bread on Sunday, and this spin on an American classic got me feeling all sorts of summer cook-out vibes. I’m looking forward to next weekend for summer BBQs and picnics, and I’ve got a day off next week, so my mind is already trying to put aside the fact that it’s the beginning of a work week right now. Just get me to the weekend. Who is with me?? As soon as I unpacked from vacation, I headed out to Walmart to pick up groceries. We had nothing in the house. I relaxed most of Saturday, but Sunday I got to work in the kitchen. I had the idea for this Peanut Butter & Jelly Monkey Bread recipe, and even as a weary traveler, I was not deterred from getting it thrown together. 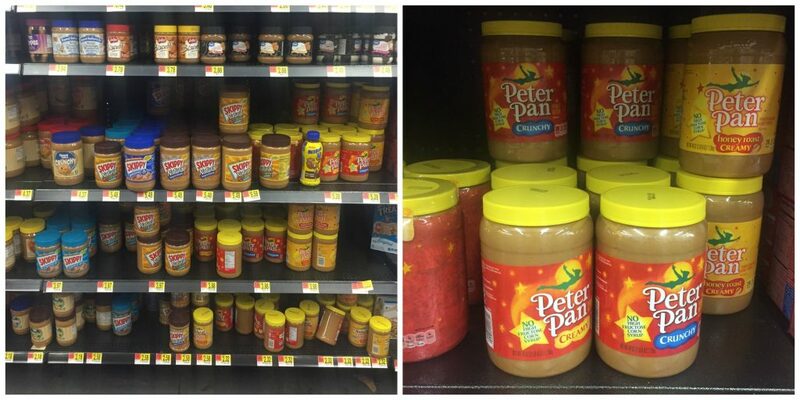 While I was at Walmart, I grabbed two jars of Peter Pan® Peanut Butter. What else is new? It’s the world’s worst kept secret that peanut butter is my favorite food. In the event of a zombie apocalypse, I could live off my stash of PB for a reallllly long time. I love Peter Pan – the ingredient list is short and simple, and it boasts a hearty amount of protein. I enjoy the wide selection and variety of options available. I picked up a big jar of Honey Roast because it’s one of my favorite flavors, but there’s something for everyone to love, for sure. It’s delicious as a spread (obvi), as an ingredient in recipes (of course), or straight off a spoon…. not gonna lie, that’s how I eat PB about 90% of the time. Interested in picking up a jar of Peter Pan Peanut Butter? If you hover over the photo, you can click through to Walmart.com to purchase! Nifty, huh? 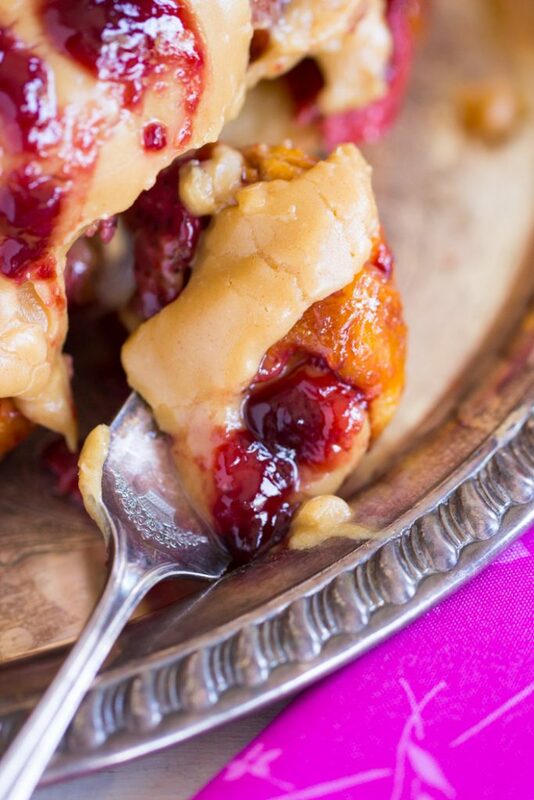 This Peanut Butter & Jelly Monkey Bread is super simple to throw together. You don’t need a lot of ingredients, and it’s quick to assemble. It’s also pretty substantial in size. It will definitely feed quite a good crowd, so it’s great to take to picnics and get-togethers. If you’re hosting or attending a big cook-out, you can also easily make a double-batch! I mean, PB&J is such an American classic, and I wanted to find a new way to represent it. 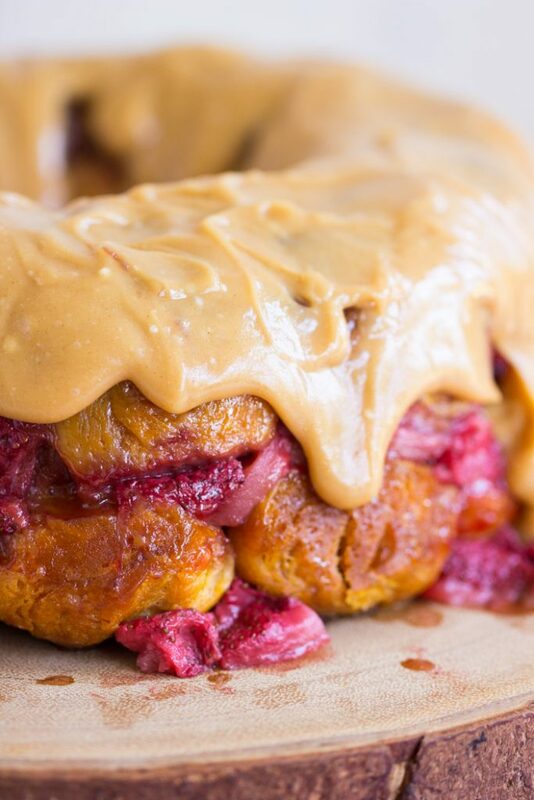 I’m on such a kick with monkey breads, so this Peanut Butter & Jelly Monkey Bread was only natural. The supermarket is bursting with fresh berries, so I incorporated a pound of fresh strawberries, and otherwise, it’s pretty loaded up with peanut butter. Who doesn’t love this classic combo? 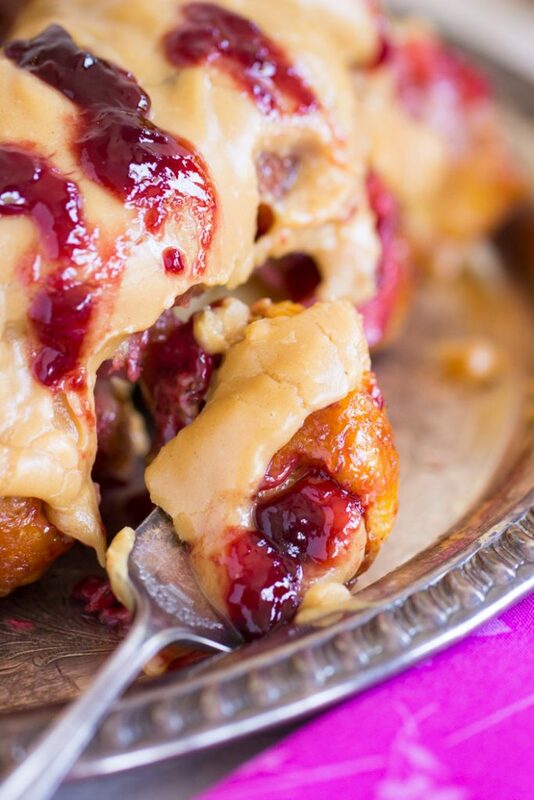 This Peanut Butter & Jelly Monkey Bread is a fun new spin on a good, ol’ PB&J. I must say, this was so ooey and gooey. Those pillowy bites of dough are nestled with fresh strawberries, and completely bathed with brown sugar and butter. 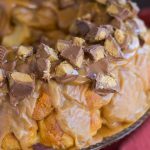 With that thick, sweet peanut butter glaze on top, this is a treat that will disappear quickly from your summer BBQs. 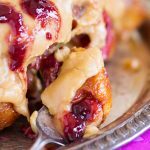 You definitely want this Peanut Butter & Jelly Monkey Bread on the menu for the weekend if you’ve got picnics and get-togethers on your agenda! Generously spray a 10-inch bundt pan with non-stick spray. Roll each half of a biscuit into a ball. Arrange half the dough balls in the prepared pan. Scatter the strawberries into the pan over the dough balls. Arrange the remaining dough balls in the pan. In a medium bowl, whisk together the butter and brown sugar. Drizzle it evenly over the dough balls. Bake at 325 degrees for 40-50 minutes, or until the top and edges are golden brown. When you press toward the center, it should feel 'set', not doughy. Remove from heat, and cool in pan for 15 minutes. Gently run a knife or small rubber spatula along the edges to loosen the bread. Invert onto a serving platter. Do not wait longer than 15 minutes to invert, or the bread will stick to the pan. In a medium bowl, whisk together powdered sugar, melted peanut butter, and 1/4 c. milk until smooth, adding additional milk as needed. 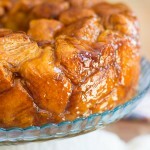 Drizzle evenly over monkey bread. Dollop with jam for garnish, if desired. For more summer cook-out inspiration and recipe ideas that are American twists on classics, click here! 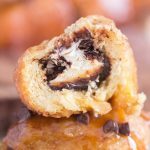 Love monkey bread? 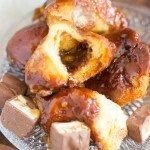 Check out these 27 Absurdly Easy Monkey Bread Recipes for All Occasions! 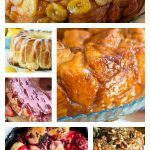 27 Absurdly Easy Monkey Bread Recipes For All Occasions!